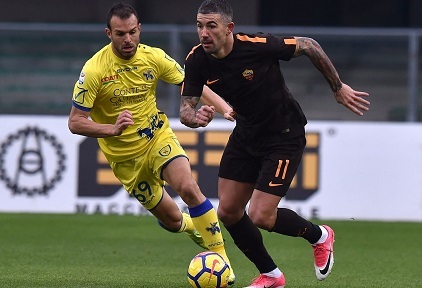 AS Roma aiming to continue their push for top four finish as they target all three points against Chievo Verona on Friday. The home team themselves will be fighting hard for points as they still hope of avoiding relegation. Here are the Possible lineups for both sides as they are gearing themselves for their Italian Serie A Friday fixture. Let’s take a further look at what kind of lineups and formation that the two teams could be preparing to help them achieving their target. Heading into this Friday fixture, both teams have already been involved in several matches whether its in Cup competition or Serie A. Let’s find out what kind of results the two sides have been experiencing to get a clear idea about their current form. Chievo continue to struggle in getting themselves out of relegation trouble, especially with their recent performances. In their last five fixtures, The Flying Donkey only managed to win one game, drawing one and losing three of them. Domenico Di Carlo’s men lats home game ended in a disappointing defeat against Fiorentina. However, they did managed to pick up one point on their recent league match, drawing 2-2 against Empoli. That draw against Rossoneri could be considered as a positive result, knowing that previously they were stumped by Fiorentina 7-1 in Coppa Italia. Eusebio di Franceso certainly hope that his players have recovered from that embarassing loss. Di Carlo will be facing a bit problem with absentees on Friday with Andrea Seculin confirmed to be out due to injury. Not only that, Sergio Pellisier is also doubtful for the game after picking up a thigh injury. Chievo will be hoping that their defense and especially goal keeper, Stefano Sorrentino can have an excellent game against Roma. Up front, The Flying Donkey will rely on Mariusz Stepinski to get them some goals. I Giallorossi themselves also facing some problems with injury as they are still without Juan Jesus and Cengiz Under. Lorenzo Pellegrini will also be absent due to suspension, while Diego Perotti’s condition remain questionable. Both Bryan Cristante and Steven N’Zonzi could both return into the starting line up after missing out on last weekend’s fixture. Edin Dzeko will still be the main goal threat up front for Roma with his size and experience. The last five meetings between both teams have been in favor or Di Francesco’s men with three wins and two draws. However, the recent match between the two sides actually ended in a 2-2 draw back on September 16, 2018 in Rome. The home team are still looking for their second win in the league this season and hoping that they can finally get it against Roma. It won’t be an easy task, but Di Carlo’s men hope that their opponent’s European football distraction can affect their performance. Entering the hectic month of Champions League football, the visitor still acknowledge their need in getting maximum points this Friday. I Giallorossi need to keep their challenge for top four place alive and well.